A series of original Jazz Guitar Licks. All licks are in tablature and notation with picking directions & fretting finger guide numbers. Theory and technique tips for each lick. Scale Diagrams included. Every lick has a Video at full speed and Audio at full & half speed and there are backing track with slower practise versions. Please Note: The eBooks have written music and are not suitable for smaller screens. 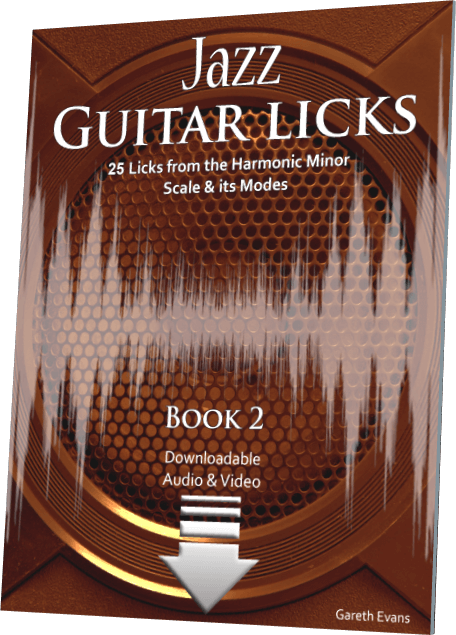 Licks based on the modes of Major, Dorian, Phrygian, Lydian, Mixolydian, Aeolian & Locrian. 117 bars of music over 25 licks (average lick length 4.68 bars). Licks based on the modes of Harmonic minor, Locrian Natural 6th, Ionian #5, Dorian #4, Phrygian Dominant, Lydian #2 & Diminished. 120 bars of music over 25 licks (average lick length 4.8 bars). Licks based on the Melodic minor, Dorian b2, Lydian #5, Lydian b7, Mixolydian b13, Locrian Natural 2 and Altered mode. 118 bars of music over 25 licks (average lick length 4.72 bars).